DELRAY BEACH, Fla., Dec 12, 2017 (SEND2PRESS NEWSWIRE) — Get in the picture with your pets using Pet Selfie Stick-It, a new invention from Fromm Works, Inc. that conditions pets to look at a smartphone located up to 20-feet away. Utilizing Pavlovian conditioning the kit includes a treat tray that holds the pet’s favorite treat. 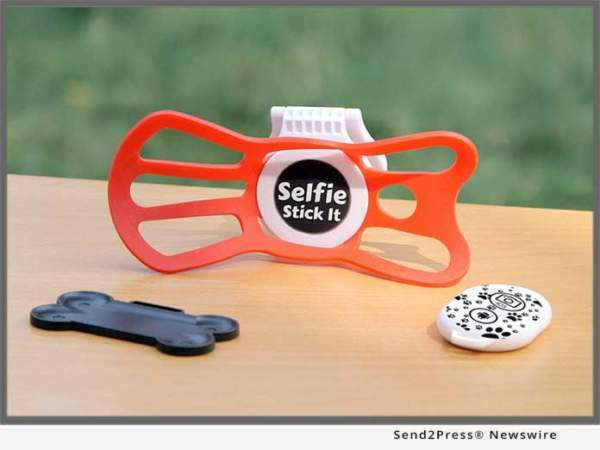 The new product for pet lovers was created by award-winning inventor Wayne Fromm, known for his many Disney toy inventions, a psychology grad and acclaimed inventor of the original handheld selfie stick for digital photography. “Growing up I was the photographer in the family and I don’t have any photos of me with my childhood dog, Fluffy. I want everyone to be able to capture memories that they’ll cherish with their lovable pet,” said Fromm. Pet Selfie Stick-It(R) uses a safe, reusable sticky gel to provide a strong temporary means to mount a smartphone on walls, park benches and other surfaces. With the included remote control the smartphone can be up to 20-feet away from the subjects. Pet owners can capture portraits and videos with their pets, easily and remotely. They simply attach the stretchable holder around a smartphone, stick to any surface using the reusable sticky gel, put a treat on the tray, get in the picture and snap away with the included remote control. Sticking the smartphone at eye level of the pet is the key to capturing natural looking pet photos. Five percent of every Pet Selfie Stick-It sold will be donated to pet related causes. U.S. Patent No. 9,606,424. Foreign Patents Pending. Fromm Works, Inc. is an invention/design company headed by Wayne Fromm and daughter Sage Fromm that has marketed dozens of commercially successful products carrying such brands as Disney, Mattel and Nestle and is a proud supporter of animal welfare organizations. Learn more at: http://www.frommworks.com/.